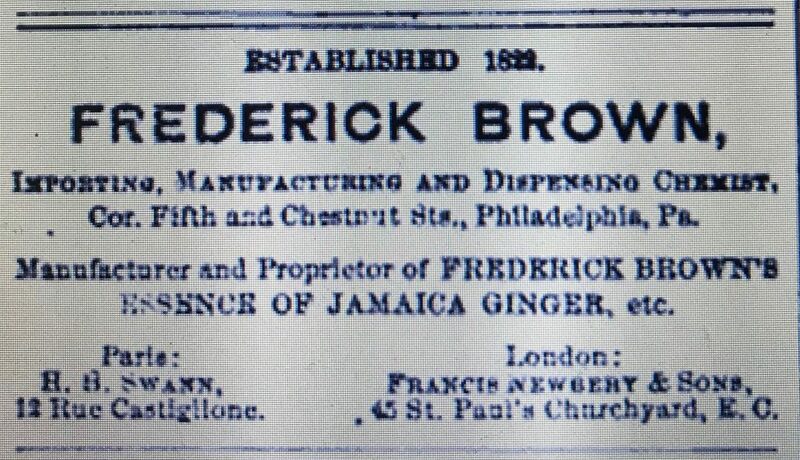 The original manufacturer of F. Brown’s Essence of Jamaica Ginger was Frederick Brown, whose business, for most of its history, was located in Philadelphia, at the northeast corner of Fifth and Chestnut Streets. Over the course of almost 100 years it was run by three generations of the Brown family. A photograph of what appears to be his original store appeared in a commemorative book entitled ” The First Century of the Philadelphia College of Pharmacy,” published in 1921. Based on Brown’s own newspaper advertisements from the 1880’s, Brown began making his Essence of Jamaica Ginger in 1828. That being said, it wasn’t until 1849 that advertisements for it began to appear in the newspapers. 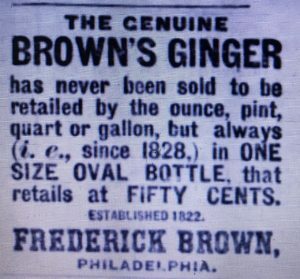 The first newspaper advertisement that I can find for Brown’s Essence of Jamaica Ginger was dated June 2, 1849 and it appeared in several newspapers that year including the August 11, 1849 edition of the Sunbury (Pennsylvania) American. Interestingly, according to the last sentence of the ad, it was available in Sunbury, not from a drug store or sales agent, but at the newspaper office itself. Another early item, which appeared in the Louisville (Kentucky) Daily Courier on November 29, 1849, appeared to be introductory in nature. 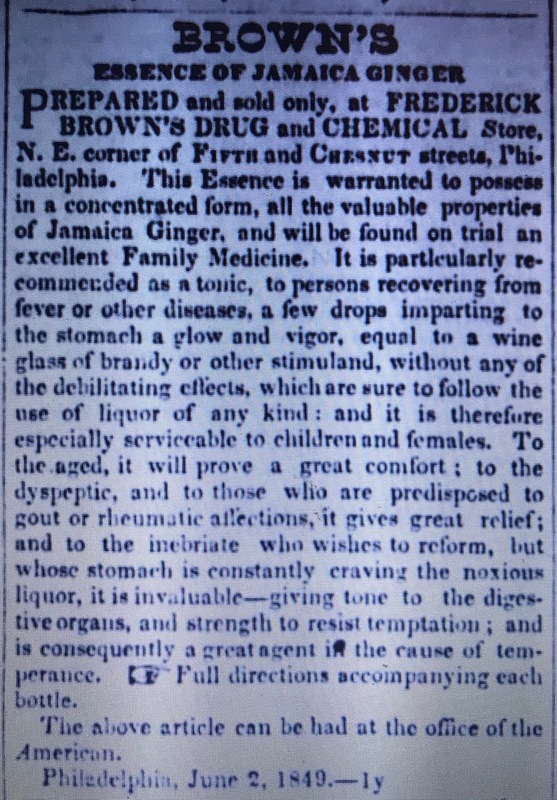 Mr. Frederick Brown, the well known Philadelphia druggist and chemist, has prepared a medicine he calls “Brown’s Essence of Jamaica Ginger,” which, on account of its great virtues and utility, is bound soon to acquire a wide reputation and popularity. It is an excellent tonic, possessed of all the stimulating qualities of brandy without any of the debilitating effects produced by liquor, and it is strongly recommended to inebriates who wish to reform. The medicine is for sale by T. H. McAllister, Pearl Street between Market and Jefferson. These advertisements lead me to believe that between 1828 and the mid to late 1840’s, his Essence of Jamaica Ginger was manufactured in his drug store, in small quantities, and sold locally. This apparently changed in 1851 when his original shop was replaced with a large multi-story building. In addition to expanding his manufacturing facilities, this new building also continued to house Brown’s corner drug store as well. Called the Frederick Brown Building, it continued to list “Fifth and Chestnut” as its address in the Philadelphia directories. The founding Brown continued to run the operation until he passed away in 1864. At that point, his son, Frederick Brown, Jr., inherited the business. Prior to that he had been managing his own Philadelphia drug store on the southeast corner of 9th and Chestnut, under the Continental Hotel. Brown Jr. continued to grow the business. By the mid to late 1800’s they were advertising in most of the east coast states and as far west as Kansas. In addition, this advertisement, printed in the June 1, 1871 edition of Philadelphia’s “The Nation,” included both both London and Paris locations as well. 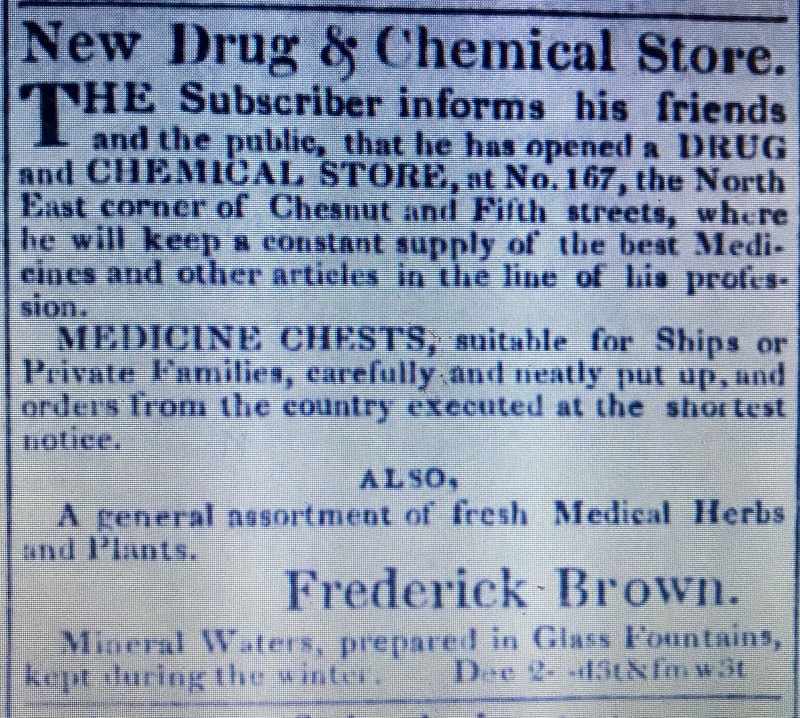 According to his obituary printed in the October 15,1894 edition of “The Pharmaceutical Era,” Frederick Brown Jr. discontinued the retail store in 1889 in order to focus on manufacturing. In 1864 his father died, and he secured full possession of the business. The store at Fifth and Chestnut was somewhat improved and he remained there until August, 1889, when he moved to 127 South Fourth Street. This store was right in the financial heart of the city, and the business soon began to assume large proportions. But, notwithstanding, Mr. Brown was not contented. Since his father’s death the drug portion was attended to by his manager, Charles G. Dodson, who in 1890, bought out the store. Mr. Brown was then free to devote himself to the manufacture of the Essence of Jamaica Ginger, which he had been doing for some time, and with which his name has since been identified. Around the same time, on September 4, 1890, he incorporated the business as the Frederick Brown Company. Their early corporate information was included in a publication called Philadelphia Securities, published in 1892. He entered the employ of the Brown firm in 1860, when only fourteen years old, and remained with them until his death….Everyone knew “Ned” Robertson, or “Doc” as he was called by patrons of the drug store. After Frederick Brown Jr.’s death on September 25, 1894, the third generation of the Brown family, Frederick Zerban Brown, assumed the presidency. In 1898, he re-established the retail store/pharmacy in the Frederick Brown Building. An item in the September, 1898 edition of the National Druggist described the new store. The company has recently determined to re-establish the pharmacy on the ancient corner, where, for so many years – upwards of three quarters of a century – the Browns, father, son and grandson, held forth. 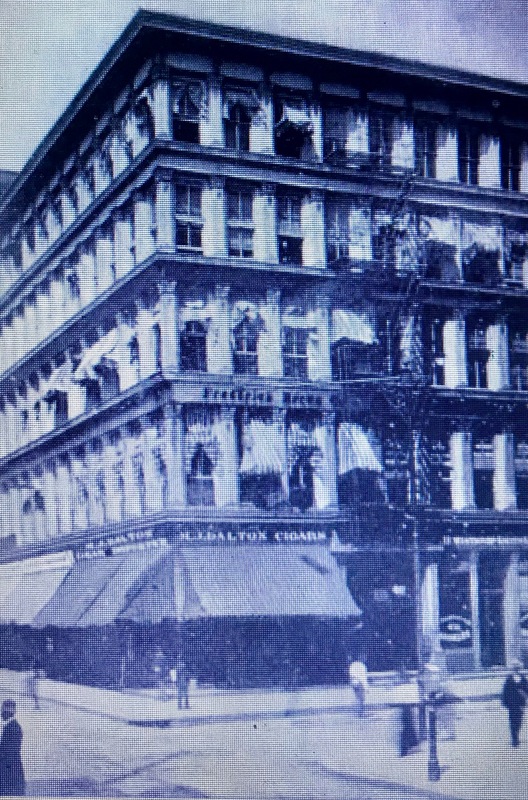 The company remained in the Frederick Brown Building on Chestnut and Fifth until 1907 when it was torn down to make way for construction of a new building called the Lafayette Building that is still there today. This necessitated a move to 17 N. 6th Street, where the business was listed through 1919. Throughout the years the company was associated with a wide range of proprietary medicines. This 1885 advertisement alone included 15 different products with the Brown name attached. Without a doubt though, their signature product and largest revenue producer was Brown’s Essence of Jamaica Ginger. Sold as a curative for the stomach and bowels, their advertisements typically touted it as the “Standard Family Medicine.” This advertisement, printed in more than a few 1861 editions of the “Philadelphia Inquirer,” was typical. 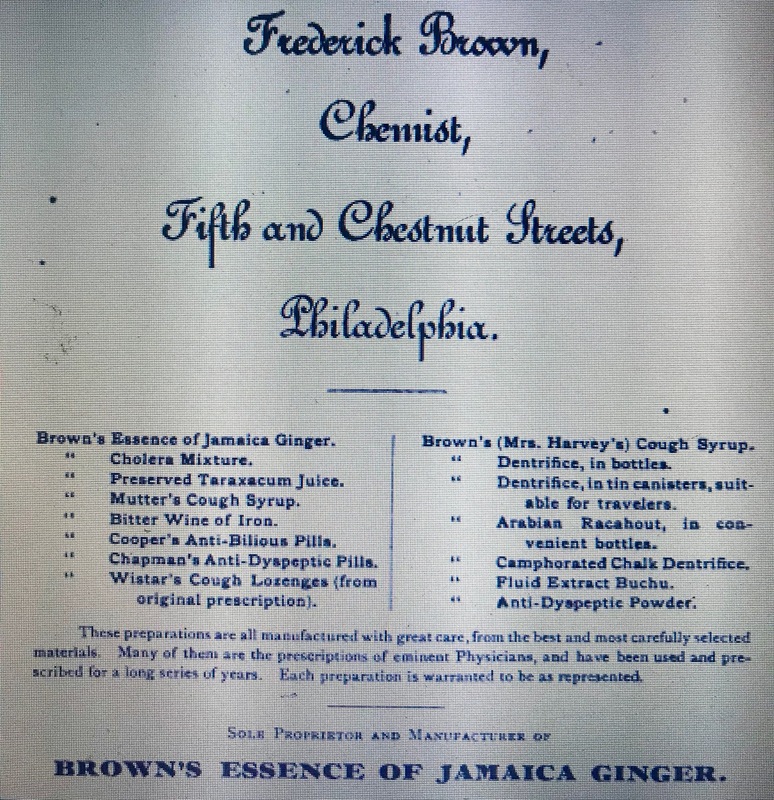 Brown’s Essence of Jamaica Ginger – Frederick Brown, Chemist and Druggist, N. E. corner of Chestnut and Fifth Streets, Philadelphia, sole manufacturer of Brown’s Essence of Jamaica Ginger which is recognized and prescribed by the medical faculty, and has become the standard family medicine of the United States. The essence is a preparation of unusual excellence for ordinary diarrhea, incipient cholera, in short, in all cases cases of prostration of the digestive functions, it is of inestimable value. During the prevalence of epidemic cholera and summer complaints of children, it is peculiarly efficacious; no family, individual or traveler should be without it. Another advertisement, disguised as a news item in the May, 18, 1861 edition of the Philadelphia Inquirer suggested that it was an indispensable item for the soldier heading off to fight in the civil war. In ordinary diarrhea, incipient cholera, and in all cases of prostration of the digestive organs, the medicine has been found a sovereign remedy, and we therefore feel it to be a humane suggestion to the multitudes who are now about exchanging the comforts of home for the exposure of the camp, to recommend them to supply themselves with this invaluable medicine. Let all our readers interest themselves in carrying out this suggestion, by seeing that every soldier who leaves our city is provided with this simple, but effectual safeguard against sickness and suffering. 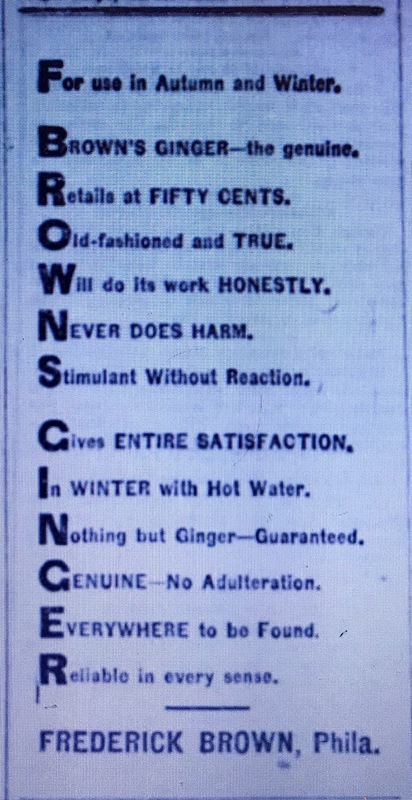 Like many patent medicines of the time, Brown’s Essence of Jamaica Ginger contained a high percentage of alcohol. Nonetheless, their label provided dosage recommendations for children as young as two years old. Prepared by Frederick Brown, successor to and devisee under the will of Frederick Brown deceased. Dose – For a grown person one teaspoonful, for a child 10 to 12 years old, half a teaspoonful and for a child 2 to 5 years old 15 to 20 drops. To be given in sugar and water. It is particularly recommended as a tonic, to persons recovering from fever or other diseases, a few drops imparting to the stomach a glow and vigor, equal to a wine glass of brandy or other stimulant, without any of the debilitating effects, which are sure to follow the use of liquor of any kind; and it is therefore serviceable to children and females. To the aged it will prove a great comfort; to the dyspeptic, and to those who are predisposed to gout or rheumatic affections, it gives great relief; and to the inebriate who wishes to reform, but whose stomach is constantly craving the noxious liquor, it is invaluable – giving tone to the digestive organs, and strength to resist temptation; and is consequently a great agent in the cause of temperance. 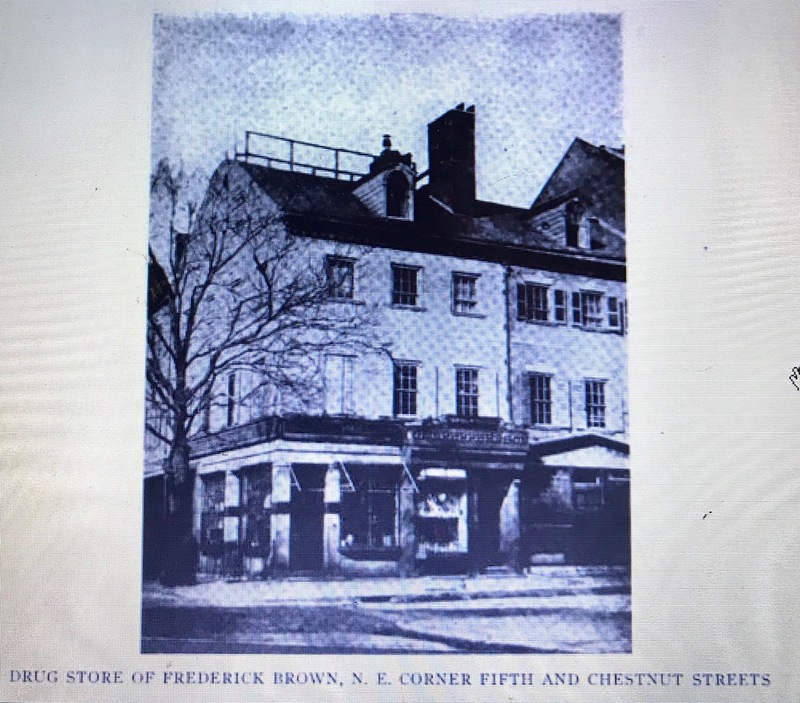 With the coming of national legislation affecting alcoholic medicinal preparations , the Frederick Brown Company, of Philadelphia, has decided to terminate a prosperous business which is now in its ninety-ninth year. Frederick Brown’s Essence of Jamaica Ginger has always been made the same way as in 1832 and of the very highest quality of ingredients. It contained less alcohol and more ginger than the U. S. P. IX article. It’s certainly possible that Henry Robertson’s death in 1919 may have also contributed to the closing of the business. The bottle I found is a mouth blown oval shaped flask, probably four or five ounces with a flat, finish. It was probably made sometime in the late 1800’s or early 1900’s. Earlier versions of the same bottle utilized a tapered finish.